So you walk into a bar and your hungry, the waitress takes your drink order, what do you order? If you are me you order a Bloody Mary, with ALL the veggies and garnishes! Every now and then I get a craving for a Bloody Mary at really weird times but not for the alcohol or the drink but the salt and garnishments. So what better thing to do than turn what I call a salad in a cup into a real salad! Full of flavor and it hits the spot, no vodka required. 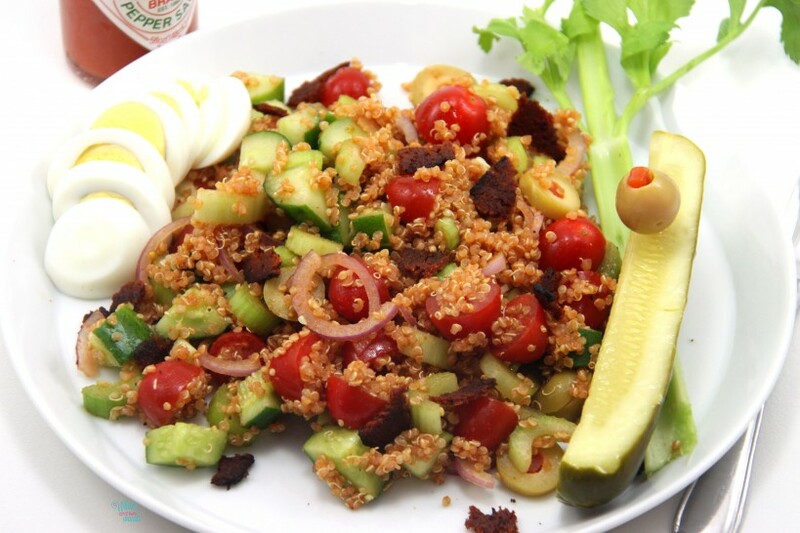 I had two ways I was going to go with this salad but settled on this one for now, but feel like there will be a Bloody Mary 2.0 Salad in the future. 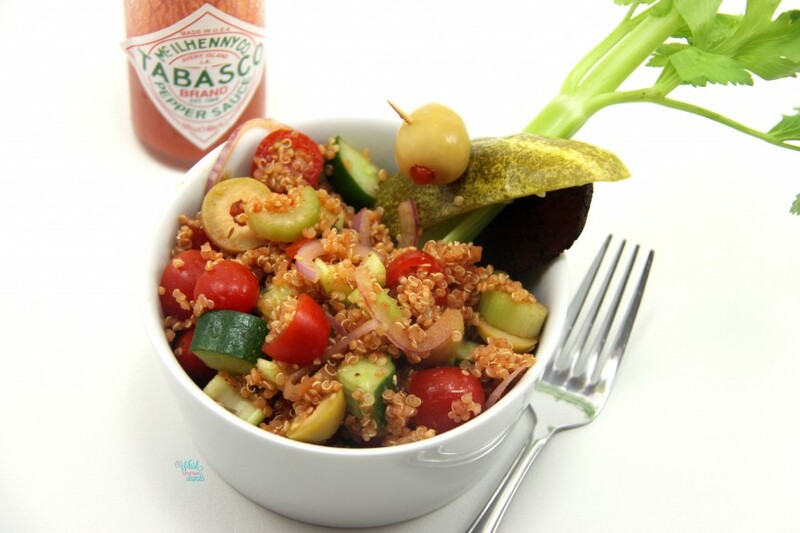 Quinoa cooked in Spicy V8 mixed with lots of fresh tomatoes, celery, red onion, olive, and oh cucumber. I could have gone pickles but wanted to balance out the salty olives with fresh cucumbers, but garnished the salad with a pickle spear. Yes a salad with garnishes! Top with any other toppings you may want like with beef sticks, hard boiled eggs, hot peppers, ect. I added some vegan bacon bits but left the eggs and other things to my husband. I did forget the hot peppers so those were added after the photo but again this is all up to you. Make it as crazy or simple as you want. I know some Bloody Marys get pretty crazy, like one served at a restaurant here called a Bloody Homer which is garnished with a mini donut. There is also a place here that garnishes it with a blueberry muffin. So if you want to go crazy feel free, and please tag me in your photo on social media or comment below and tell me all about it! 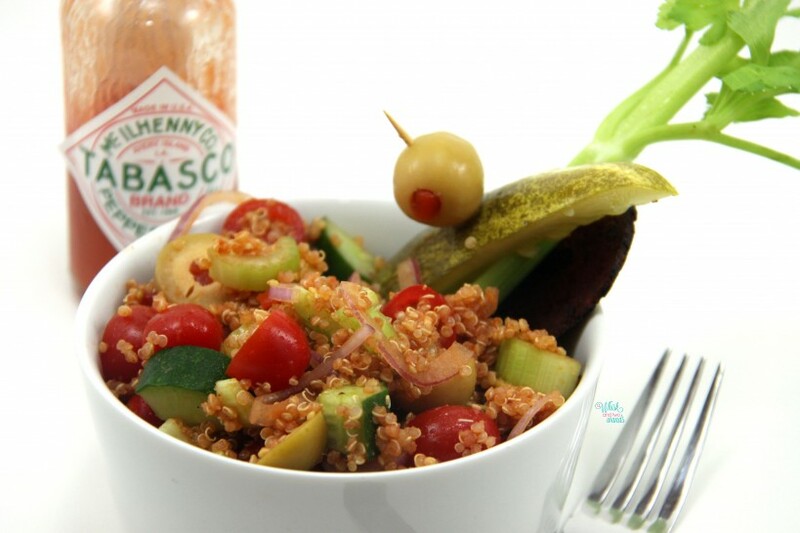 Oh and instead of adding the tabasco to the salad I serve it with to make it family friendly. Cook quinoa using V8 instead of water, cooking per package instructions. Once quinoa is cooked let cool and fluff with a fork. 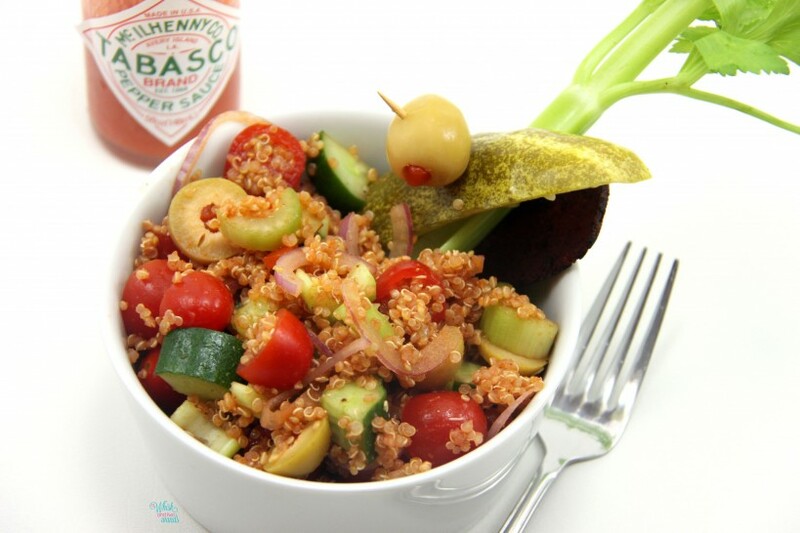 In a large bowl mix toss together cucumber, celery, onion, and olives. Gentle add in tomatoes and any other add ins you would like in the salad. Otherwise we like to personalized ours after with toppings. 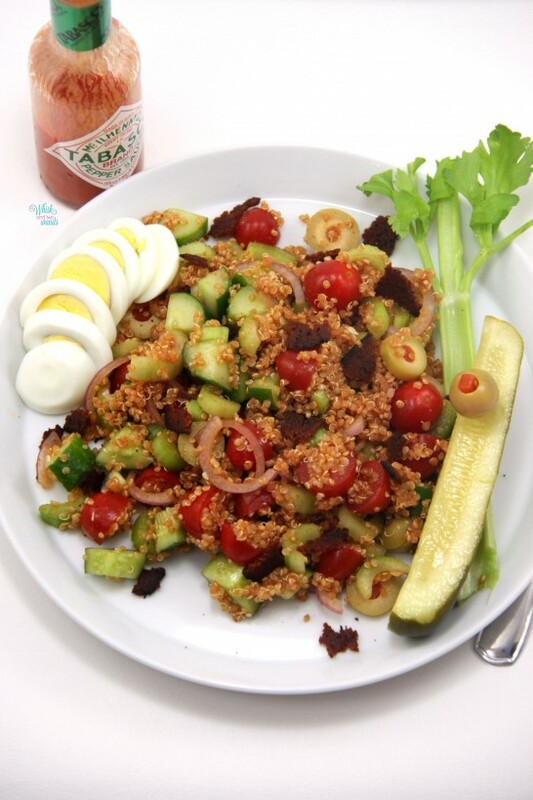 Fluff quinoa and toss in with the veggies. Season with sea salt and pepper to taste, this will depend on taste and juice used. Remember the olives and other things already add a lot of salt. Place in the refrigerator for at least 30 minutes to cool, or you can eat it warm or room temp but we like it chilled. Plate salad and top with additional toppings and garnishments as desired. 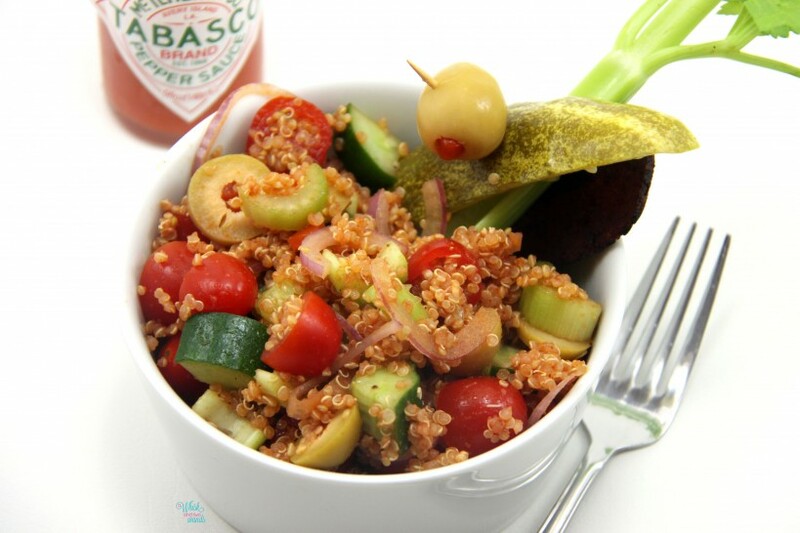 Serve with Tabasco and enjoy! You seriously come up with the most creative things!! Looks awesome!!! Woh, woh, now that’s an awesome unique idea! Yes! I love things a little spicy too! That is how I was at first I didn’t like the drink but the garnishes and salt got me hooked! Haha! Sounds like a good idea! Oooo, this looks awesome! 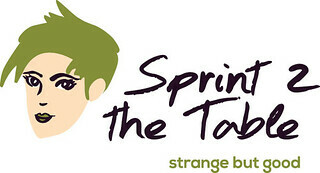 :] I love all the colors in it, and hooray for quinoa! :D!